All holsters come with a ten day trial period. If you are unhappy with your holster within ten days of purchase, you can return it for a full refund. The customer is responsible for return shipping. Lifetime Warranty applys to the holster body which is the riveted or folded plastic shell that directly surrounds the weapon. The lifetime warranty does not extend to the leather. The lifetime warranty extends only to original manufacturing defects. Any unauthorized user modifications to the body of the holster by the user from the original product specifications immediately voids the lifetime warranty. By opening the package and taking possession of your holster, you are agreeing to due diligence to check the hardware on your holster on a daily basis. Holster hardware- is the rubber grommets, spacers, screws, bolts, screw posts, washers, threaded inserts, belt clips. The hardware is covered under defects only replacement warranty. If you lose any hardware through neglect or misuse, they can be purchased from us for a fee, plus postage at precisionholsters.com. If you experience a problem with your holster it will be repaired or replaced at our discretion. Please allow 4 to 6 weeks for refund/repair or replacement. Never place a loaded handgun in a holster without first testing, in an unloaded condition (double check to make sure the chamber is empty), for proper fit with the handgun. Unless specifically noted Precision Holsters' products are designed to fit factory equipped handguns. The use of grip adapters, laser sights or any other alterations to the frame, or dimensions of the gun itself may cause improper holster fit and negligent discharge. 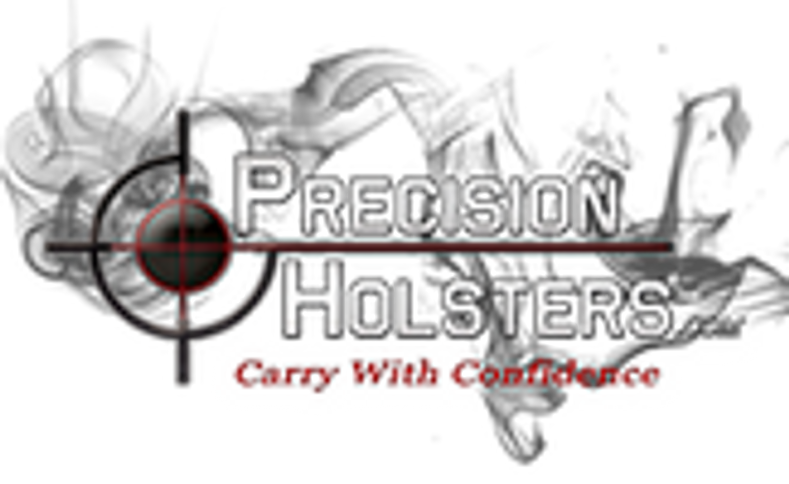 All Precision Holsters are designed and are made for the specific gun it is molded to. DO NOT ALTER YOUR HOLSTER IN ANY WAY, INCLUDING ACCOMMODATING A CHANGE MADE TO YOUR HANDGUN. This could result in a unsafe fit for your handgun and possible negligent discharge. It is the user's responsibility to personally check for your holster handgun compatibly using actual products. It is also the user's responsibility to regularly check the holster and its hardware for proper fit and function. Should a holster become worn, loose, defective, or ill-fitting at any time, cease use immediately. Great care should be used when handling, storing or transporting firearms or when inserting or removing a handgun from holster. We collect personally identifiable information, like names, posted addresses, email addresses, etc., when voluntarily submitted by our visitors. The information you provide is used to fulfill your specific request. This information is only used to fulfill your specific request unless you give us permission to ise it in another manner, for example to add you to one of our mailing lists. The site may use cookie and tracking technology depending on the features offered. Cookie and tracking technology are useful for gathering information such as browser type operating system and tracking the number of visitors to the Site. Cookies can also help customize the Site for visitors. Personal information cannot be collected via cookies and other tracking technology, however, if you previously provided personally undeniable information, cookies may be tied to such information. Aggregate cookie and tracking information may be shared with third parties.